Each figure will include REQ Pack Codes to unlock in-game content for Halo 5: Guardians on the Xbox One. These will include kill animations, weapons, armors, skins and more. Check out more info and a few images after the jump. A Kotobukiya Japanese import! 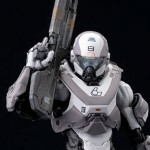 Kotobukiya’s innovative and popular Halo ARTFX+ Statue series continues, adding the latest and greatest in armor technology with the Spartan Athlon! First there was the iconic Master Chief along with Mark V and VI armors, then came a basic techsuit body and the Mjolnir Mark V/VI DX Two Pack. Now coming to you right out of Halo 5: Guardians is another combo set offering a new internal techsuit body and removable slide/snap on armor pieces. The heavy duty assault armor is three-toned with ghostly white, gray, and black for a super clean look, and orange details and the blue visor really pop. The Athlon armor set comes with additional interchangeable parts like hands in different positions, and like the rest of the new Halo ARTFX+ line the internal techsuit body even has limited articulation for posing options! Sculpted by M.I.C., the Spartan Athlon stands nearly 8 1/2 inches tall (1/10th scale) and comes with magnets in his feet for added stability on his included metal display base. Collect all of the Halo Spartans and Master Chief ARTFX+ statues! These are expected to drop between Q4 of 2015 and Q1 of 2016. You can share your thoughts and check out the images after the jump! The new photos can be seen after the jump.